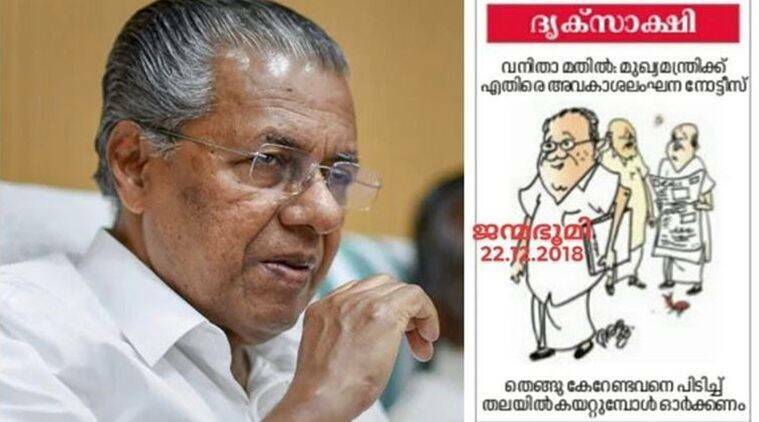 On December 22, a cartoon carried on the front page of the newspaper mocked Chief Minister Pinarayi Vijayan by alluding to his caste. The cartoon drew considerable backlash for the BJP/RSS and the newspaper management on social media. On December 22, a cartoon carried on the front page of the newspaper mocked Chief Minister Pinarayi Vijayan by alluding to his caste. The cartoon drew considerable backlash for the BJP/RSS and the newspaper management on social media. The ruling CPM hit back with finance minister TM Thomas Isaac slamming the Sangh Parivar for its ‘primitive’ and ‘ancient’ thinking. He said the cartoon added a shameful tinge to the rich cartoonist legacy of the state. On Tuesday evening, a Facebook post on the newspaper’s verified page initially announced that Gireesh Moozhipadam, who drew the cartoon in the December 22nd issue, will not draw for the daily again. The newspaper said it could not stand along with a cartoon that saddened or hurt the sentiments of any person. It added that it was unfortunate that the cartoon led to a controversy. The post was shared by Kavalam Sasikumar, a deputy editor at the daily. However, minutes later, the posts disappeared from the pages of the daily as well as Sasikumar’s personal Facebook account. It was not clear whether the newspaper’s decision to fire the cartoonist was rolled back. The newspaper’s editors and Sasikumar did not respond to calls for a comment on the matter.